I’ve been working hard on the book I’m calling The Centuries Unlimited (aka Time Trains aka Raj Station, aka Renaissance Express). 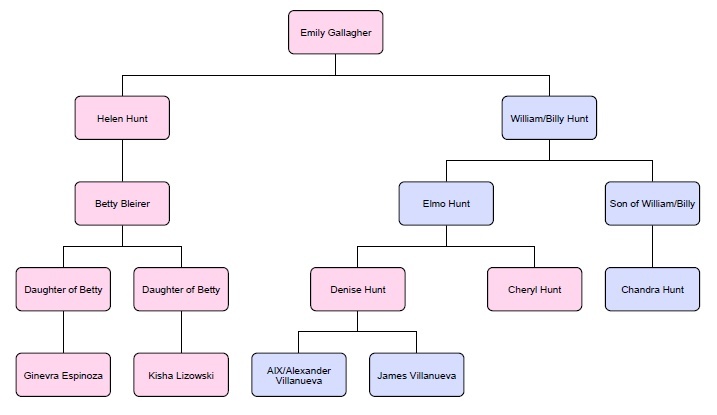 Posting my progress here, the first thing I’ve completed is the future family tree of the protagonist (plus a few unrelated supporting characters). Helen Hunt (relationship character) 33-y.o. (b. 1909) a detective. Emily’s daughter. John Williams (antagonist) 35-y.o. (b. 1907) a human-trafficker and mobster. William Hunt 61-y.o. (b. 1919) a politician. Emily’s son. Elmo Hunt 40-y.o. (b. 1940) a mad marketer. William’s son. Betty Bleirer 36-y.o. (1944) a spy. Helen’s daughter. Denise Hunt 36-y.o. (b. 1974) a cyborg mechanic. Elmo’s daughter. Cheryl Hunt 40-y.o. (b. 1970) a business mogul. Elmo’s daughter. Genka Espinoza 18-y.o. (b. 1992) a cyborg vigilante. Betty’s grand-daughter. Ginevra Espinoza 46-y.o. (b. 1992) a professor. Betty’s grand-daughter. Chandra Hunt 35-y.o. (b. 2003) a counter-terrorist. William’s grand-son. Al X 30-y.o. (b.2008) a terrorist. Denise’s son. James Villanueva 25-y.o. (b. 2013) an artist. Denise’s son. Kisha Lizowski 28-y.o. (b. 2010) a monster hunter. Betty’s grand-daughter. Alexander Villanueva (b. 2008) 57-y.o. a call-center rep. Denise’s son. This entry was posted in Blog and tagged Alternate History, The Centuries Unlimited, writing. Bookmark the permalink.